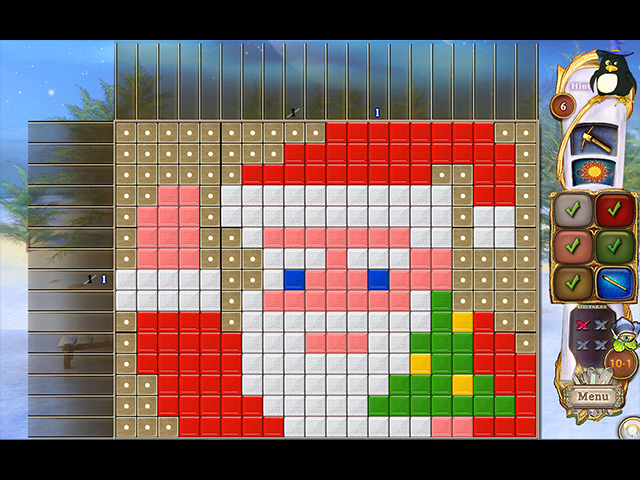 ‘Tis the season for holiday mosaic puzzle fun! The penguin family received an invitation to go to the North Pole to visit Santa's hut for Christmas! Join the Penguins on a magical journey across the snowy landscape to get inside Santa's workshop and find out what he has in store for the holidays! Help them discover even more colors to enrich their mosaic palette. 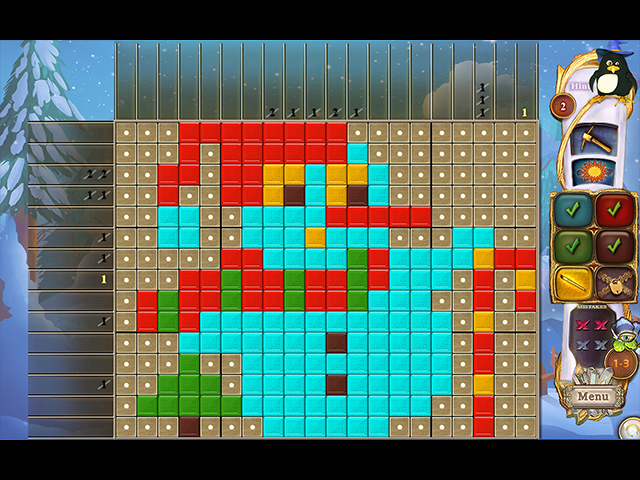 Fantasy Mosaics 32: Santa's Hut is rated 4.4 out of 5 by 11. Rated 5 out of 5 by myxomatosis from FM 32 Rings the Bell Again! I've been playing this series since FM 15. I completely agree with everything pennmom36 says above. I also love the series just as it is, for the reasons she states. (I always appreciate her informative descriptions, as in her paragraphs after the review proper.) Similarly with MrsBen's review, except that I never, ever play a game with the music on, so have nothing to say about that. My one, very minor niggle: I'm not crazy about the artwork in the scenes after each level. 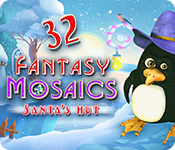 Rated 5 out of 5 by verimeri from love fantasy mosaics These are great mosaic style games. They are logical and don't require guessing. 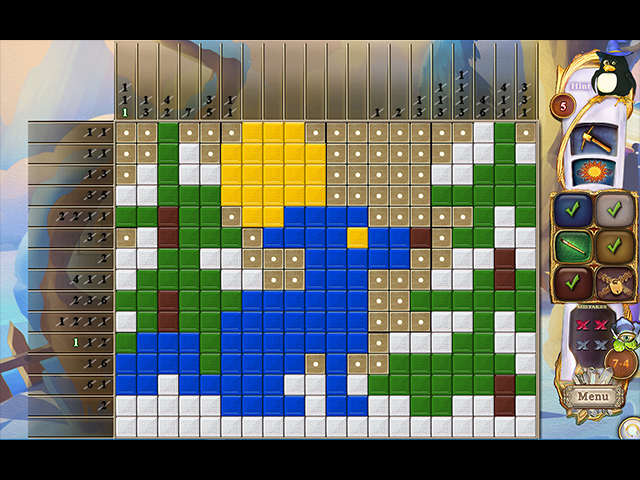 Another thing I love about Fantasy Mosaics is the puzzles are mini scenes not just a single object. The colors are great, you choose your own preference. As long as Fantasy Mosaics comes out with new games I will buy. Rated 5 out of 5 by Penyenka from Fun times This series is really good for a relaxing and entertaining adventure. The story lines are rather clever and just cute. I recommend this entire series for anyone who just wants to enjoy something. If you are a serious gamer then you will enjoy the expert mode. Try it. You'll like it. Rated 5 out of 5 by memphis836 from Another Winner Such a nice Christmas game. Fantasy Mosaics just keep getting better and this is so much fun. If you like the Mosaic games, you will LOVE this one. The pictures are pretty, the colors are bright. It's a fun game to spend time with. I recommend! Rated 5 out of 5 by cyndrap from The whole penguin family is back and all new Loved to see this for the holidays. I love this penguin family. They are all at the north pole and visiting Santa. All new puzzles, great colors and good challenge. Rated 4 out of 5 by tartartic321 from The penguin family returns I love this type of game and have all of the Fantasy Mosaics. This one was good, but either I'm getting really, really good at these or this one was easy. I don't think I'm that good. I still love the technical aspects of the gameplay. The colors are easy to see and distinguish from each other. The puzzles themselves are always interesting and this one is no different. I just think that this one was a little too easy.